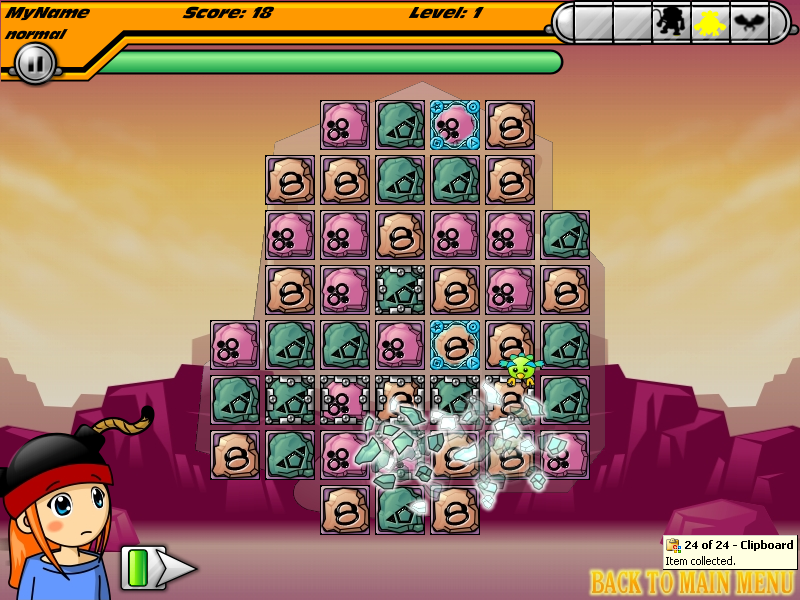 Magic Blast is a fun and challenging puzzle game. The unique design challenges you to find matches in a constantly shifting game board. To complete a level in Magic Blast, you must blast all the blocks with a blue border. These blocks have forest creatures trapped inside. There are several ways to blast a block. You can find a match of 3 or more of the same colored blocks, or you can use magic blocks. Lightning bolts can be used to blast all the blocks directly above and below the lightning bolt. Horizontal lightning bolts can be used to blast all the blocks directly to the right and left of the lightning bolt. Bombs can be used to blast all of the blocks immediately adjacent to them. When you destroy a gremlin, the fireball button will appear in the lower left portion of the screen. If you click the button, you can then blast any single block on the screen. Magic Blast also has several other bonus blocks that allow you to manipulate the game board. Wild card blocks can substitute for any other color of block making it easier to create matches. Clicking on a Shuffle block will blast every block on the game board with the exception of blocks that have critters or bonuses inside. It can be used to randomize the game board. Clicking on a Clock block will give you extra time to complete a level. It will also give you more time in between block shifts. Clicking on a Reverse block will shift all blocks on the game board backwards. Unlike other blocks, the reverse block will not go away when you click on it. You can continue to use the reverse block to shift all the blocks on the game board backwards. You can find the 'Push Button' in the bottom left of the screen. The Push button has a green 'Magic Meter' inside it. When you find matches, it charges your magic meter and the green bar rises. You can then click the 'Push Button' to push all the blocks on the screen forward. When you click the 'Push Button' your magic meter goes down. If the meter turns red, you can no longer use the 'Push Button' to push the blocks until you have charged your meter by finding more matches.